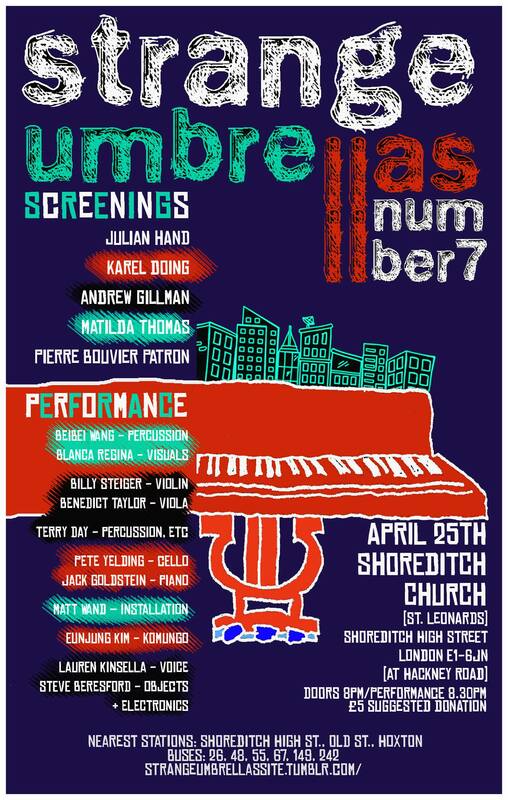 We can finally announce the complete line-up for the next Strange Umbrellas on April 25th at Shoreditch Church. We are looking forward to performances and screenings from Matilda Thomas, Lauren Kinsella, Eun-Jung Kim, Beibei Wang, Andrew Gillman, Julian Hand, @Pierre Pierre Bouvier Patron, Billy Steiger, Benedict Taylor, Terry Day, Matt Wand, Karel Doing, Steve Beresford, Pete Yelding, Blanca Regina and Jack Goldstein. In response to a request by the foundation Dziga to make a short film inspired by the famous filmmaker, I combined footage that I had shot in Paris with shots of short actions performed by Andrea Emonds. The idea was to recreate my incomplete memory of a film that I saw many years ago. The event of seeing this unknown film had blurred in my mind, but nonetheless some of the images presented themselves crystalclear. Additinally the organisers of another event, celebrating the repair of a mediaeval organ, also asked me to present a short film. I asked them if the organist could play an improvisation with my film, and their positive respons resulted in the soundtrack that I added to my mix of memory and reality. A dreamy document about finding a fragile treasure amongst a hasty crowd, the drinking of water, some wandering between stones, and the vulnerabilty of human life. ‘Neon Rendezvous London’ is an attempt to glean a personal poetic interpretation of the obscured luminescent poem omnipresent across the capitals plethora of neon signs. ‘Neon Rendezvous London’ is a combination of selected signs drawn from the ‘Neon Word Archive’ (Signs, words and shapes found across the city’s topography committed to S8mm celluloid) then reconfigured to generate a poem reflecting the capital and ones existence or experience within it. The intent of the video piece is to share an alternative view of the capitals neon signs and offer the audience a chance to engage with neon word play or the poetry inherent within it. This version of the video poem consists of 431 neon signs collect on celluloid in the city of London between 2007 – 2010. Kink is a glimpse into the life of a twenty first century woman, a portrait of an artist making ends meet in the metropolis, how much is one worth as an artist? A real-life documentary which examines the little kinks of society. ‘I Didn’t Do Anything’ is the second of a set of three short films. We find same character at his mother’s funeral and reveal the secret thoughts hiding inside his head. One character, but we see his differing ‘points of view’: what he is saying, what he is actually thinking, and his subconscious/neurotic self. This allows us to evesdrop on his internal dialogue set against his external conversations. These films examines the usually very well-hidden internal debate that occurs in situations of desire, uncertainty and stress.